Anna-Maria: What is that smell? Anna-Maria:: We have pink lungs don't we mum. Anna-Maria:: What colour lungs do boys have? 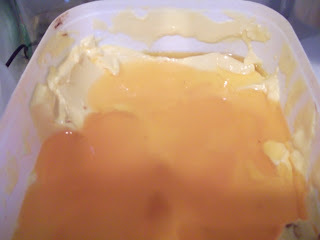 Mum: "Oh no do not look in the margarine container!" Joseph: "Come on let me look. I'm a man." Joseph to mum: "You're so in trouble!..." That's the tub of margarine after sitting on the stove while the roast was cooking. I was singing a church song which goes like this: "and so my needs are great"
Anna-Maria said "Our knees aren't grey are they?" I cracked up then asked her "who has grey knees?" Anna-Maria: "Nobody!" (as if that was such a silly question).